Midweek DFS soccer sweats are a blast, whether it be UCL or EPL DFS. This week doesn’t figure to disappoint. This will be part 1 of the gameweek match breakdown. It isn’t often that we get 2 main slates, so excuse me while I take advantage. Part 1 is dropping today. Part 2 will drop tomorrow for the Wednesday slate. In between reserving your contests and your research, take a look at what else we have going on in the DFS Army, just in case you haven’t heard of us or seen us at the top of your leaderboards. Arsenal’s job this year just got a bit simpler. They are coming off a FA cup loss in a season where the FA Cup needed not be a goal. The flip side of that saw them lose 2 central defenders for the time being. This means they will need to piecemeal the back line. At least their opponent this week doesn’t present an overrunning offensive punch. This will allow them to build something going into their weekend match with City. Cardiff would need a herculean effort to get a result if we believe their recent play. They got waxed by Tottenham at home, managed a draw with Huddersfield, and then got thumped by Newcastle. With Bournemouth preparing to visit them over the weekend, they will likely be trying to escape with a draw. I like Arsenal in this one, but I don’t like a clean sheet. Pierre-Emerick Aubameyang and Alexandre Lacazette are where I would start in this matchup, in that order. Cardiff presents usable targets on Fanduel with their central defense. Sol Bamba will be plenty busy all match. Brighton has been better on the road, as of late, but I don’t expect it to really continue. They have not had sustained success all season on the road and they are traveling to a team that is sneakily on the rise. Fulham still has plenty to work on but their last 3 home matches have seen them lose (late) to Tottenham, shutout Huddersfield, and draw with Wolves. That last one is the one that speaks volumes to me. The Wolves defensive prowess on the road is elite. If we snapshot the last 3 weeks, Fulham has actually been twice as good as Brighton in the attacking sense. Fulham still has defensive issues to work out but I am less worried about that in this matchup. I will likely be staying away from this match, in large part. These 2 squads have faced off 4 times before and only once has it gone over 2.5 goals. The model doesn’t favor that record getting better. My favorite plays are the keepers. I shade more to Jordan Pickford than Jonas Lossl, but both are in play. We could very well see this play to a low draw. This entire match is GPP. Hey! I just wanted to take a break to tell you about our Beat The Bookie service over at the DFS Army. 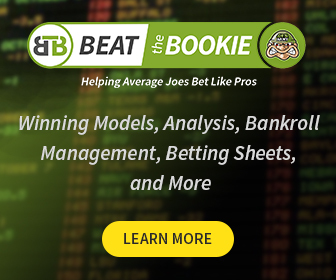 With the supreme court ruling that sports betting is legal, the DFS Army has launched their “Beat the Bookie” site. This is where we have handicappers teaching members how to make bets as well as sharing their proven models. If you have ever wanted to try your hand at sports betting, it’s better to do it with the help of winners in your ear. We have teamed up with the site MyBookie. If you are a new user and deposit at least $50, you will get a free month of the DFS Army Beat the Bookie service. I find this match to the most interesting one of the day. The history says it will finish under 2.5 goals, but both teams are in their element. I would not be shocked to find this one shoot out a little bit. Let’s start with the home side. West Ham has been vulnerable to forwards. They tend to play a fast pace on the road and press as much as they can. If this game gets at a fast pace, I think Raul Jimenez will have plenty of space to work with and plenty of chances. The visitors present some GPP opportunities. I am looking towards central options up and down the lineup. The Burnley bus is rolling into Manchester and it is parking itself in their goal box and setting the emergency brake. It’s all Red Devils in this one, but I’m not convinced that you need to go nuts jamming them all in your lineup. Marcus Rashford will garner a lot of ownership (for good reason) and if you go with him, he may be all you can fit. He is the highest-priced player on both sites. Another City slate, another City stack. My model lists them as the high scoring team of the slate and I will be proceeding accordingly. Not that this is the week to make up ground but City needs to keep pace and they need to make a statement. Newcastle is vulnerable to forwards and I like attacking them from the left. That means Leroy Sane is in play in any format and whoever starts at central forward is a potential GPP play.